The Lord showed me this and related it to faith for finances. As I prayed and waited before Him, He said to me by the Holy Spirit, "The money you need is down there. It isn't up here in Heaven. I don't have any money up here. I'm not going to rain any money down from Heaven. If I did, it would be counterfeit, and I'm not a counterfeiter. It's Satan who is keeping money from coming, not Me." Then I remembered that Jesus said, "Give, and it shall be given unto you; good measure, pressed down, and shaken together, and running over, shall men give into your bosom" (Luke 6:38). When men give to you, God is behind it. But it's still men giving it. After the Lord showed me this, He said, "Whatever money you need, just claim it." We have a right to claim our needs met because Jesus came to the earth and defeated Satan. We're in the world but we're not of the world (John 15:19). Since we still have to live in this world, we must use our God-given authority to enforce Satan's defeat. This is how we will enjoy the blessings of God we have in Christ, including financial prosperity. That's why when the Lord told me to claim the money I needed, I understood what He meant. He was telling me to believe and exercise my spiritual authority in the area of finances. The Lord said to me, "Don't pray about money like you have been. Whatever you need, claim it in Jesus' Name. Then tell Satan to take his hands off your money and command the ministering spirits to cause it to come." In 1950 when I began to see how faith worked in the financial area, it was all new to me. In fact, I said to the Lord, "I understand the part about exercising authority over the enemy, claiming the finances, and telling the devil to take his hands off my money. 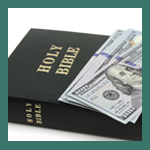 But what do you mean about commanding the ministering spirits to cause the money to come?" The Lord said, "Didn't you read in My Word, 'Are they not all ministering spirits, sent forth to minister for them who shall be heirs of salvation?'" (Heb. 1:14). "For" means the angels were sent to do something for us. At the time, I was holding a meeting in a church. After the Lord showed me this, I claimed the money I needed. Then I told the pastor, "Don't make any special pull for money. At offering time, say as little about it as you can." The pastor said, "If I just say, 'This is Brother Hagin's offering' and pass the plate, you won't get over a dime." "If I get just a dime," I said, "you won't hear me say a word." I had claimed $200. When the 10-day meeting ended, I had the $200 plus 40-odd dollars over that amount! The pastor said, "That beats anything I've ever seen in my life!" This church thought $50 a week was big. They would have thought $75 a week was wonderful, and $100 a week would have been a miracle! And I received more than $240 in 10 days!